The Waltham Chronicle is an interesting example of a twelfth-century historia fundacionis. Written by one of the secular canons of Waltham just after the refoundation of the house as an Augustinian priory (later abbey) in 1177, it records the legends of the original foundation and miracle stories, together with historical information about the pre-Conquest benefactors and the internal organization of the community. Its value is much more than that of a local history, because of its connection with the literary romances of Harold Godwineson, the religious context of the theology of the Cross, and the general movement to replace sector colleges by houses of regular Benedictine monks or Augustinian canons. 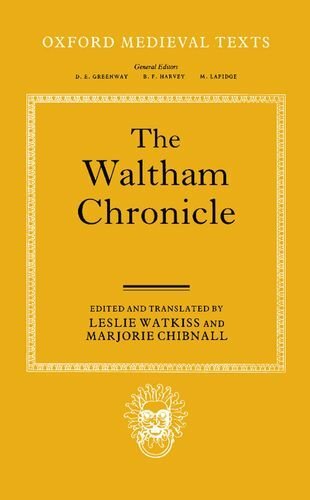 This is the first published translation, printed with the original text editied from the two manuscripts containing the Chronicle, with full introduction, historical notes and apparatus criticus, by Leslie Watkiss and Marjorie Chibnall.